The Cliffs and Falls of the Yosemite Valley. The Yosemite Valley, according to the California geologists, is nearly in the centre of the State north and south, and in the middle of the Sierra, which is here seventy miles wide. It is nearly level, about five miles long, one half to a mile wide, and sunk nearly a mile perpendicular below the neighboring region. It is an irregular trough, with many projecting angles not corresponding with recesses on the opposite side, an argument against its being a geological fissure. At its eastern end it branches into three cañons, the Tenaya, little Yosemite, and Illilouette, down which flow three main branches which form the Merced River in the valley; the last two with fine falls, the first with a beautiful crystal lake. At the west end it is narrow and V-shaped. The walls are almost vertical, and of great height, both absolutely and compared with the width of the valley, and are remarkable for the small amount of debris at their base. The most distinguishing characters are the domes and the waterfalls, any one of which in Europe would be of world-wide fame; there is nothing in the Old World to compare with either, and of the latter many, far surpassing anything in the Alps, are not noticed, as there are so many fine ones demanding the traveller’s attention. Coming in from the Mariposa trail, as you descend from Inspiration Point 3,000 feet, slowly and painfully to yourself, and with pity for the horses, you come at every turn upon views of surpassing grandeur and beauty. On the left stands the massive “El Capitan,” an immense block of bare, smooth, light-colored granite, 3,300 feet high, projecting squarely into the valley, and with almost vertical sides. At first you cannot realize its stupendous bulk and height; there is no standard to judge by where everything is on so grand a scale nothing but climbing about, among them will open your eyes to the amazing heights of the cliffs and falls. Of El Capitan, Whitney says “it seems as if hewed from the mountains on purpose to stand as the type of eternal massiveness. It is doubtful if anywhere in the world is presented so squarely cut, so lofty, and so imposing a face of rock.” In a recess in one corner is the “Virgin’s Tears” fall, 1,000 feet high, rarely seen by travellers, as the creek which supplies it is dried up early in the season; it is superior, while it lasts, to the famous Staubbach fall in Switzerland, the admiration of Alpine tourists, and one of the finest in Europe. The Indian name of El Capitan is “Tutocanula,” said to be an imitation of the cry of the cranes, which in winter used to enter the valley over this rock. Directly opposite is the beautiful “Bridal Veil” fall, about 700 feet in perpendicular height, and 200 more of cascades as it rushes over the debris at the bottom of “Cathedral Rock,” over which it pours; the creek which supplies this fall, you pass when going to “Sentinel Dome,” and the coolness of its clear water is sure to be tasted by the traveller and his horse. In the dialect of the Indians, this is “Pohono"—a blast of wind, or the night wind, from the chilliness of the air experienced by coming under the cliff, and perhaps from the swaying of the sheet in the wind like a veil; others think Pohono was all evil spirit, whose breath was a dangerous and deadly wind. Whatever its derivation, the poetical name of the Indian is, here as in other places in the valley, much superior to the English one. As in all the falls, the amount of water varies greatly with the season, being greatest in May and June; it is most beautiful later in the summer, when the volume of water is small, as it then sways more gracefully in the wind. The “Cathedral Rocks,” over which the “Bridal Veil” falls, are neither so high nor so vertical as El Capitan; though only about 2,600 feet high, they are very grand whichever way you look at them; from one point the pinnacles called the “Spires” are so squarely cut that they remind you of the towers of Notre Dame in Paris. These grand masses, amid so many grander, are hardly noticed by the tourist; what appear on the top like bushes are evergreens 125 to 150 feet high, as large as those which excite your wonder in the valley. On the opposite side is a triple group of rocks, known as the “Three Brothers,” rising one behind the other, the highest being 4,200 feet above the valley. The Indian name is “Pompompasus,” or “Leaping Frogs,” from a fancied resemblance to three frogs with their heads turned in one direction, the highest in the rear as if in the act of leaping. Nearly opposite the “Brothers,” just in the rear of the first hotel, or Leydig’s, is “Loya,” or “Sentinel Rock.” This is a slender peak of granite, over 3,000 feet high, the upper third standing up like an obelisk or signal tower; it is one of the grandest masses of rock in the valley. Behind it, and more than 1,000 feet higher, is the Sentinel Dome,” before described, not seen from the valley. From “Sentinel Rock” descends a small fall, 3,000 feet high, 400 feet higher than the Yosemite fall, but reduced in July to a mere thread, unperceived by most travellers; in early spring it is a very beautiful cascade. 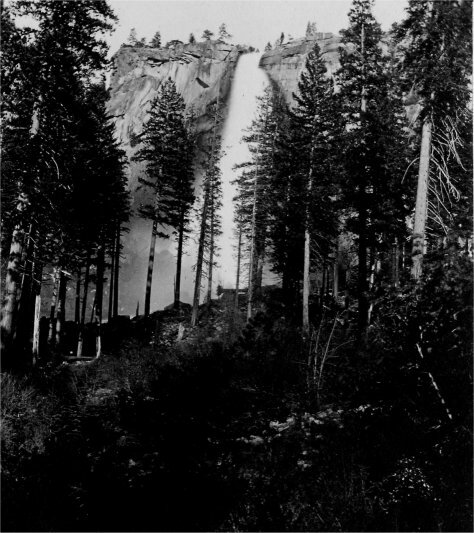 The great feature in the valley to most persons is the Yosemite fall, just opposite, surpassing in height all others, here or elsewhere, having an equal body of water. The grandeur and beauty of this fall and its surroundings are, in a measure, familiar from excellent photographs, engravings and paintings. The creek which supplies the water is fed by the melting snows of the Mt. Hoffman group, ten miles to the northeast; of course this volume of water varies greatly, being very large in spring, but in August reduced two-thirds. When generally seen, in June and July, the stream at the fall, according to Whitney, is twenty feet wide and two feet deep. The height is 2,600 feet, half a mile; a vertical fall of 1,600 feet, swaying in the wind and broken into spray in a most beautiful manner, and falling into a deep, rocky recess; then a descent, in series of cascades, of 600 feet; and then a final plunge of 400 feet to the bottom of the valley, falling upon a rough assemblage of rocks, then flowing off to join the Merced River, being ignominiously made to turn a saw-mill on its way. All the falls you see well from “Sentinel Dome,” opposite, distant two and a half miles, and considerably above them. It is impossible to imagine anything finer than this scene under a full moon. Following up the Tenaya cañon, over a very rough trail among boulders and rolling and rough stones, you come to “Mirror Lake” (“’Waiya”), so called from the reflection in its still, clear water of the surrounding peaks, Mt. Watkins and others. Farther up is “Cloud’s Rest,” nearly 7,000 feet high, connecting with the higher Sierra, and frequently surrounded by clouds when the other peaks are clear. Returning and going up the cañon of the main Merced River, you visit the “Vernal” and “Nevada” falls, each the body of the main river. The trail is in many places difficult, but nowhere dangerous, with ordinary care; you are almost constantly ascending, winding in and out, up and down, along the banks of the stream, which flows with great rapidity and turbulence in its rocky bed, affording some enchanting views of mountain and cascade scenery. Here we met Mr. Shapleigh, an artist from Boston, with whose ink sketches most of our California tourists are now familiar. After about a mile’s climbing, you arrive in sight of the “Vernal Fall” (Piwyack, white water, or shower of diamonds), about 400 feet high. The granite behind the sheet is square, and little, if any, eroded by the falling water; so that it is hard to believe that this cañon fall have been the result of any causes now in action there; there must have been a subsidence, as most observers think was the case in the formation of the valley itself. The trail up the cañon in its upper portion, around and along the steep side of the mountain, is slippery, and wet with the spray; you can ride by a rough road to the top, but most persons prefer to walk, muddy and moist though it be. You can go no farther than the base of the cliff bay the path, and you willingly stop to rest and admire the ever-changing rainbows over the water, and enjoy the refreshing coolness and shade. At this point there is a spacious cavern, formed in the concentric layers of granite peculiar to this region; this was once probably the lair of wild animals, and the still wilder Indian, as it is now said to be of the rattlesnake. The ascent is now made by perpendicular and not very strong ladders of wood, making the nervous tremble lest their feet should slip, and anxious lest they should meet a rattlesnake sunning himself on the landings along the ascent. These reptiles are numerous here, and are frequently killed by the sticks with which cautious travellers arm themselves; though we met none alive, the rattles exhibited, and the dead ones hanging to the trees, show that they are too common for comfort. At the summit the view down the cañon is indescribably grand, and the more enjoyable as a parapet of granite runs along the edge, just high enough to support you in safety almost on the very brink. Going up the stream by a very rugged and often steep path, winding around immense boulders which have fallen from the heights on each side—the beautiful Merced River foaming along in its rocky bed, with rapids succeeding each other in endless variety, in one place shooting like silver lace-work over a smooth surface into a pool of emerald hue—crossing the main and rushing stream on a rude bridge, and some of its torrents on trunks of trees, not altogether safe because steep and slippery, you come, after a mile of hard climbing, to the “Nevada” fall (“Yowiye,” slanting or twisted water). This name is given because just below the edge is a projecting shelf, which receives and throws to one side a great portion of the water; this adds much to the picturesqueness of the fall, by its unusual shape. It is the grandest in the valley, having a large body of water of extreme purity, falling about 700 feet; it is surrounded by majestic mountains, the most noted of which is the “Cap of Liberty,” or “Mt. Broderick” (Mah-ta), 4,600 feet high, and almost as grand as the “Half Dome.” The descent between the Nevada and the Vernal falls is about 300 feet. Returning you may look up the cañon of the Illilouette, where in early spring is a fine fall of 600 feet, rarely visited, from the difficulty of the trail. The Yosemite Valley is nearly level, sloping very gently to the southwest, the sluggish Merced River, about seventy feet wide, flowing through it; it ends in a narrow cañon to the west. It is 4,000 feet above the sea, and contains some swampy meadows supporting alders; there are also the spruce and poplar, and in the sandy parts the pitch pine, white cedar, firs and oaks. The walls are light gray, very bright in the sun, here and there discolored by organic matters in solution in the water; most paintings give the rocks a golden haze which they do not possess. lack of color arising from the union of cold gray granite and sombre evergreens; the valley is so narrow, and the walls so high, that the sun practically sets early in the afternoon, adding a premature dusk to the wild scenery. How was this grand and unique valley formed? Nowhere is the tremendous erosive action of water more fully exhibited than in the great cañons and valleys of the Sierra Nevada; cañons 2,000 feet deep have been worn in hard lava by the long-continued action of mountain torrents, and the rocks are everywhere channelled by this cause; but these gorges do not have the vertical walls of the Yosemite, nor such perpendicular granite surfaces as “El Capitan,” 3,000 feet high, meeting each other at right angles; the faces here are turned down the valley, opposite to that in which erosion by water could have acted. The “Half Dome” rises vertically 2,000 feet above the level walls of the valley, and the same distance above the action of water, even had its torrent filled the whole valley. There is no apparent source of supply for the water necessary to have produced such an erosion, even upon the wildest glacier theory; the valley is too irregular and sharp upon its sides, and the cañon of exit too narrow to admit of this explanation. The erosive action of ice cannot be reasonably advanced as the cause; there is no evidence of ice-action in the valley, though there is plenty of it on the sides above it, and to the very edge; moreover, the work of ice, as seen in the Alps and elsewhere, is entirely unlike what is seen in the Yosemite Valley. It cannot be regarded as a geological fissure, for the walls are on an average half a mile apart, and the same in depth; and they in no way correspond on the two sides. As it is transverse to the line of the mountain upheaval, it cannot be the result of folding. There remains the hypothesis of the California geologists, which seems to me the true one, viz. : that during, or perhaps after, the upheaval of the Sierra, there was a subsidence—that the bottom of the valley sank down to an unknown depth, the support underneath having been withdrawn during the convulsion. This explains the absence of debris, which has gone down to fill the abyss. 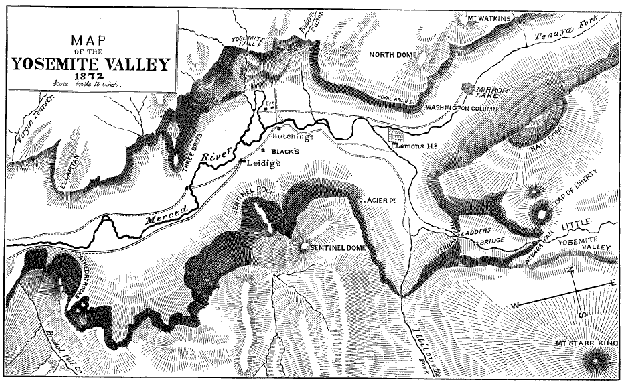 The valley was undoubtedly once filled with water; the disappearance of the glaciers, the gradual dessiccation of the country, and the filling up of the abyss, have converted the lake into a valley with a river running through it; the process of filling is continually going on from the action of the elements upon the surrounding rocks. There are other examples of similar probable subsidences, as in the little Yosemite and Hetch-Hetchy Valleys. Lake Tahoe and its valley are perhaps the result of a similar subsidence, the lake occupying the cup of a sunken crater.